I'd like to officially announce that Monodraw is entering maintenance mode. We have been working on an update that brings a command line tool to Monodraw! 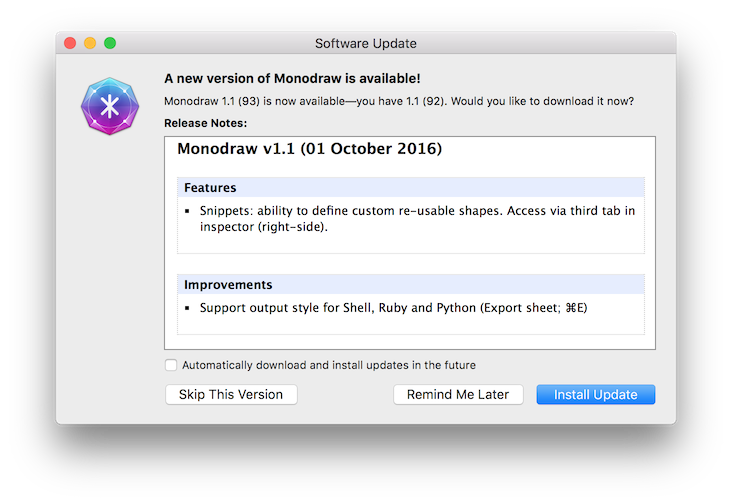 Monodraw v1.2.3 is now available for download. We have been working on a major update to Monodraw that adds several much requested features! Monodraw v1.1 is now available — make sure you have checked out the Snippets sneak peek! We have been working on a very important update to Monodraw and we wanted to give you a sneak peek. We're adding a much requested feature - Snippets! Snippets allow you to define re-usable shapes that can be easily shared with other Monodraw users. 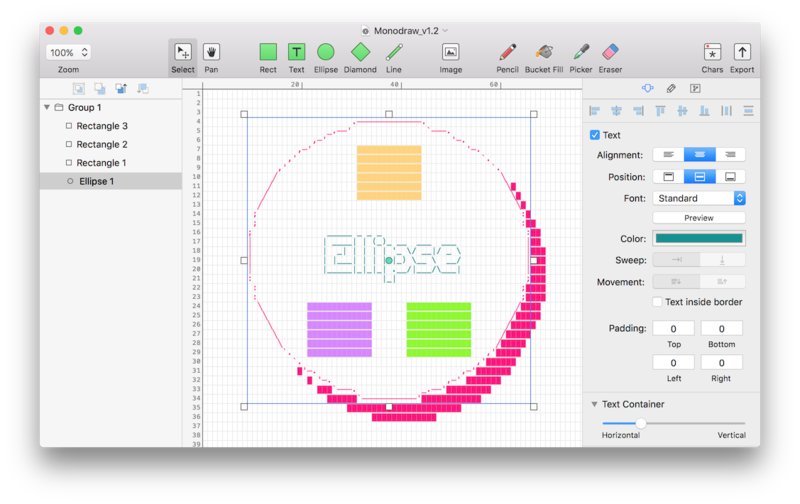 I'm extremely happy to announce that our ASCII art editor Monodraw has finally shipped. Go grab the trial and have fun! If you like the app, you can purchase directly from us or from the Mac App Store. Monodraw's beta program will be closing sometime in the next few weeks. We have just shipped v0.9 which added the last feature before v1 hits. Lines, an essential part of almost every diagram, are very well supported in Monodraw. But one of the app's weak spots is the poor support for line labels. We've made significant improvements in this area which I want to cover in this post. Infinitely scrollable areas are a common problem when implementing apps which provide a never-ending canvas. Let's take a look how we can do it using NSScrollView. As an ASCII art editor, Monodraw's primary purpose is to generate plain text. But textual art requires a monospaced font environment which may not always be available. It has been less than 24 hours since the launch of the Monodraw beta and we have just released our first update adding the ability to include comment tags when exporting. The feedback that we have received so far has been absolutely great — keep it coming! The wait is finally over – Monodraw is now available! It has been five months since our announcement and the app has greatly improved in that time – we truly hope you enjoy using it. We have seen a large shift in the app economy over the past 7 years which has had a huge impact on indie software. In many ways, we have regressed to state which is simply unsustainable in the long term. If you only look at the highly publicised successes, you might assume independent developers are rolling in cash. Do not be fooled, the situation on the ground, especially on iOS, is actually very different – many indies are struggling to make a living. I'm very excited to announce that work on the beta of Monodraw has now completed and the app will be launching very soon! The last few weeks have been extremely hectic while trying to finish off all the remaining bits and I finally feel we are at a stage where the app is ready for the wider public. Entity relationship diagrams are an indispensable tool used to visualise ER data models. I have added two new features to Monodraw which now make it possible to create such diagrams with just a few clicks. It has been almost a month since I shipped the Monodraw Alpha and we have received some incredibly good feedback! 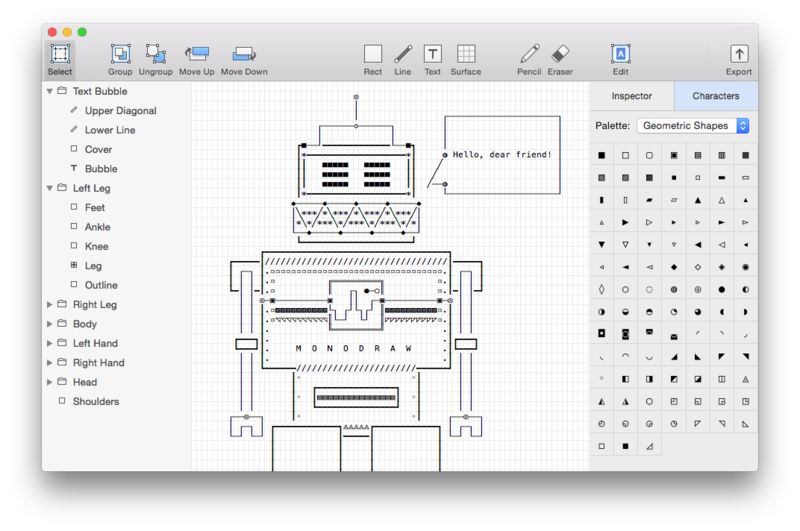 I'm excited to announce that we just shipped the alpha of Monodraw. This gets us yet another step closer to the public release of the beta. With the new year just around the corner, we want to wish you a very happy festive period and lots of luck in 2015! It is time for our second Monodraw beta progress update. I have been busy implementing some very important changes that have significantly increased the app's utility and usability. Let's take a detailed look at what has been happening over the past few weeks. Making software is a collaborative process. It's very important for us to meet the needs of our customers and that's why we are launching our lab programme where you can get exclusive pre-release access to our software while it's still being actively developed. ASCII art, or more generally text-based art, uses characters to represent pictures. It is crucial that such pictures are rendered using a monospaced font, otherwise they would appear misaligned. But even if they are displayed using a fixed-width font, things can go wrong when using Unicode characters, like in the example from Wikipedia below (running on OS X 10.9; left side shows default rendering while right side shows the correct behaviour). Let's investigate the problem. It is finally time for our first Monodraw beta progress update. It has taken a bit longer than I expected but we have made some significant progress and more importantly, completed some essential improvements to how the app works. Making great software is very much an iterative process. While perfection is unattainable, we can get incredibly close by having great attention to detail and by always striving to create better products for our customers. At Helftone, we never stop at the first iteration because we can do so much better, every single time. "Good enough" is simply not an option. I want to give you an inside look at the process of creating Monodraw's app icon. The Mac App Store was released in January 2011 and it marked the beginning of a great new distribution channel. Even though it lacked some bells and whistles, the developer community was hopeful the problems would be addressed in due course. Unfortunately, it has been years and there's no evidence that the core issues would be addressed in the future, at all. When notable developers are abandoning your platform, cannot do the right thing for their customers and are delaying their MAS submission, something is very, very broken. I believe that the inaction is harmful to the whole Mac community, affecting consumers and developers alike. Let me make it absolutely clear why I'm writing this. First and foremost, it's because I deeply care about the Mac platform and its future, it pains me to see developers abandoning it. The Mac App Store can be so much better, it can sustain businesses and foster an ecosystem that values and rewards innovation and high quality software. But if you talk to developers behind the scenes or explore the Mac App Store, you'll find something completely different. After we announced Monodraw yesterday, the reception from everyone has been absolutely incredible. The amount of support and kind words have been beyond anything that I expected. Thank you so, so much. I've read every single tweet, email and comment that I could find – your feedback is extremely important to me. I'm incredibly excited to reveal something that we've been working on for a while now. It's a new app for the Mac called Monodraw. 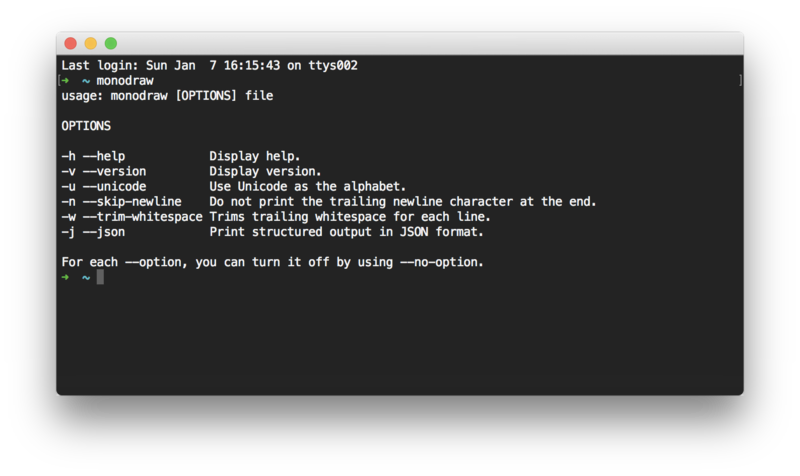 As the name suggests, it's about text art in a monospaced font environment. Here's a sneak peek of how the app looks today (work in progress), showing a robot that Atanas drew. Pentumble was recently released and lots of players have been enjoying it. The developer of the game, Chris Emery has founded his own software studio and will no longer be with us at Helftone. It felt appropriate that he will take Pentumble with him as part of the transition. I wish Chris the best of luck for the future, it was a great experience working together. Quartz 2D is the advanced drawing API of both iOS and Mac OS X. However, it is missing direct support for drawing inner shadows. We can use some clever tricks to draw inner (inset) shadows that I uncovered while investigating how PaintCode’s generated inner shadow code works. The method involves some cunning use of some less known Quartz features. While waiting for @Pentumble to appear on the App Store, we decided to treat everyone with a demo! We hope you enjoy the game and if you like it, don't forget to retweet and tell your friends about it – we might release even more levels! Download Pentumble Demo for Mac (58.3 MB). Requires OS X 10.8 or above. Over the years, AppKit has been improved and extended in many ways. In OS X Lion, Apple introduced Auto Layout, providing a more flexible and powerful way to position elements on screen. We are incredibly excited to show you the game we have been working on, so without further ado – enjoy the trailer! There has been a lot of talk about iCloud + CoreData (referred to as iCCD hereafter) over the past few months and I think it is a good time for me to share our journey in getting iCloud integrated in Clear. If you do not want to read through all the details: Clear uses a custom system built on top of iCloud File Storage and it works in a similar fashion to Operational Transformation. The post proceeds to cover the reasons for choosing iCloud, then explores iCCD and subsequently builds a synchronisation system from the ground up. Copyright © Helftone Ltd. All rights reserved.